you can't do this with mesh hair. Mmmmmm yummmmy eyebrows. And so count this as trading card #1, Wizzy, for things that mesh does not do as well. I expect a cigarette, but I guess you're still too good a girl for that. OH I also have to comment on the most excellent font choice. Good eyes in many ways, hah. OMG. I remember seeing the original ad as a little boy, sitting in a doctor's home practice, before clinics, bored out of my mind, reading out of date copies of Women's Day magazine that belonged to the doctor's wife. Stuffy old leather chairs. Musty old wallpaper. and a black and white checkerboard floor. Everything dated from the early 1940s. 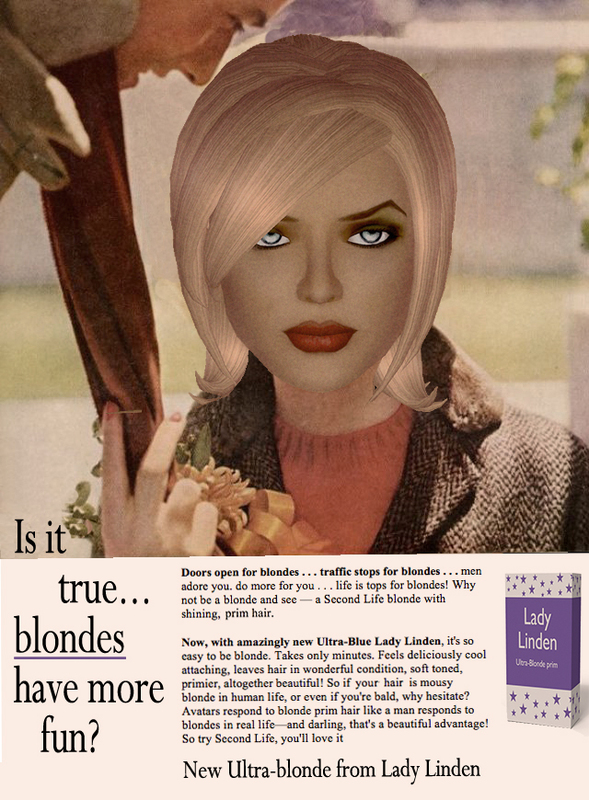 This ad is from the early 1960s. Talk about a flash-back! Wizzy: I'm woefully behind on mesh. Is there some inherent problem with mesh hair (other than many not running a viewer that will display it)? Chatelaine: I love the avatar trading card idea! As for the presence of the eyebrows and lack of a cigarette, I'm the laziest compulsive creative I know and have recycled the base image used in this one a half dozen times. As for the font, I used the closest one to the original ad. Joey: Yeah, that was a classic campaign. The copy is just mind-blowing in it's overtness.